Hello world, today I gonna show you several of American word and British word. 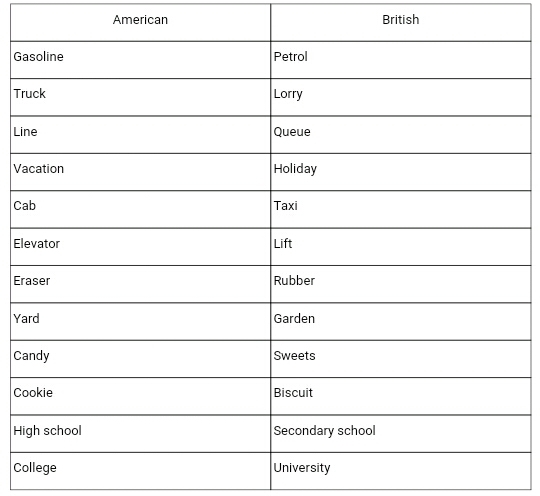 You know that there a lot difference about American word and British word, even their accent is totally different. Alright now I will show you which word the people of american and british used it in their life activities. After you read those words you know that words are similar but people of America or British have their own words to use in their life. After you visited that country you will know their differences. Alright I will give you a two paragraph which is contain both of words. Today I got new truck, I am so happy because I bought it using my own money. I drive around my city with my lorry. In the middle of travel my truck stuck on near of college, I have no idea about it. My truck stuck right in front of university, I am trying to turn on it again but I don't make any of change. So I run inside the university to get help, I run through of yard and I found some garden of sunflower. I have no idea why I can’t find someone around. So I get inside the building and found some lift so I used the lift to find someone. Lucky me I found some security on the secondary floor. So I asked them for help, then they gave me some biscuits and water to make myself relax. After little chit chat they agree to help me with my truck. After getting to my truck the security check my truck and tell me that my truck running out of gasoline, so we find some petrol around and boom my truck is fixed. Alright that was for today, I hope you like it. Thanks for reading, comments are allowed.